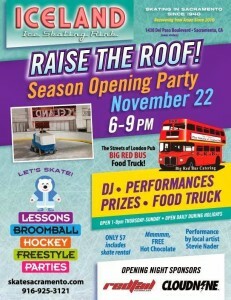 Iceland Ice Skating Rink hosts its “Raise the Roof!” Season Opening Party tomorrow, November 22 from 6pm – 9pm at 1430 Del Paso Boulevard. The party includes The Streets of London Pub’s Big Red Bus food truck, a DJ, performances (including one by local artist Stevie Nader), prizes, and more. Call 916-925-3121 for more information.